Well, it's official. I've become a fresh food glycerite addict. 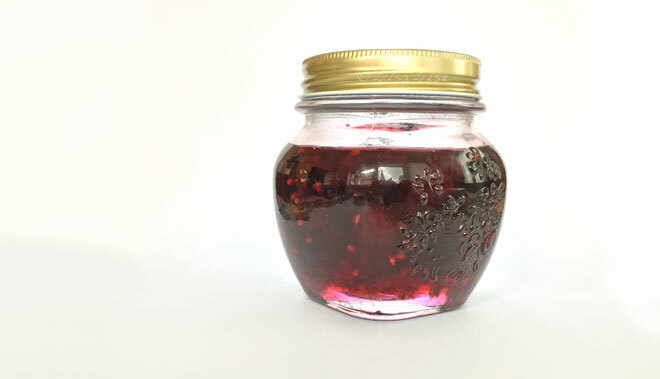 So, before we start getting serious about other Fall-related activities, allow me to share with you the final summer berry glycerite of the year. 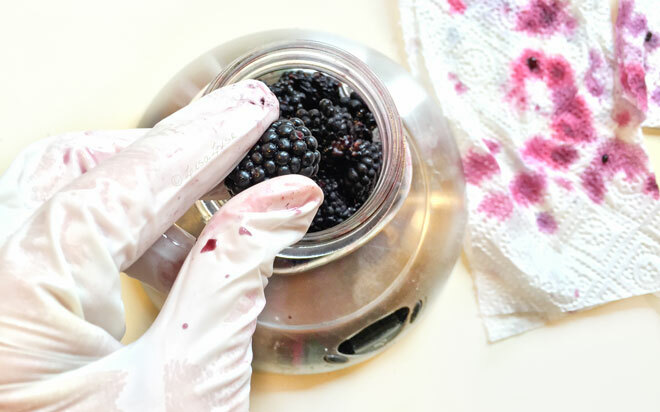 We're going to be more hands-on with this one with a slightly different straining process, so don your latex gloves and let's get busy with blackberries! 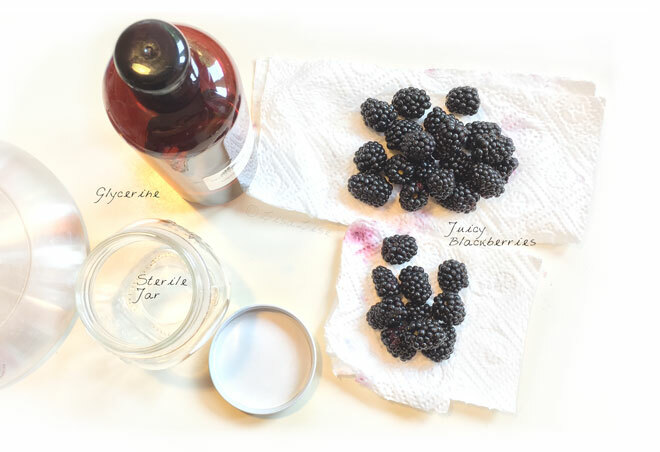 Tip: Blackberries are quick to spoil - be extremely attentive when choosing which ones to add to your glycerite. Glycerine extracts are commonly made with dried plant materials that are reconstituted with water, then added to the glycerine. The usual ratio of water to glycerine for an extract is 50/50. 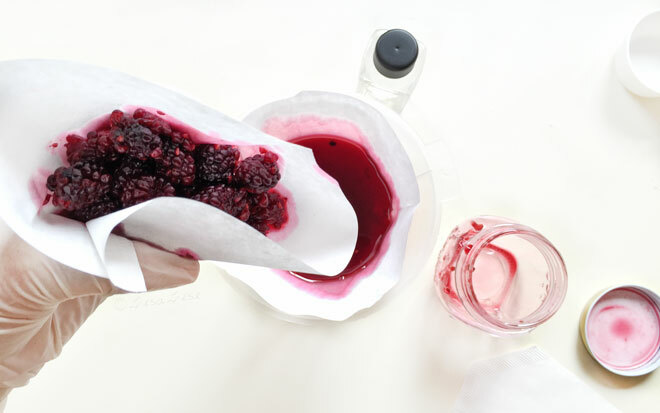 Gently crush each berry as it is added to the jar. This also allows for an extra final inspection of perfect freshness. The color will change as the days pass. Here's what mine looked like after 8 days. 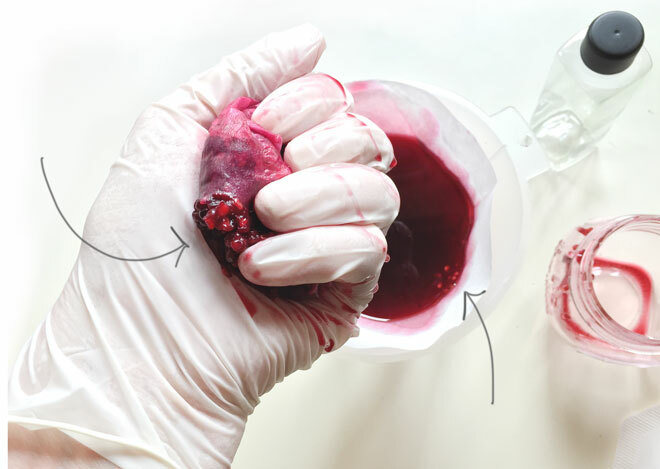 Straining is a time-consuming process, but you can speed up the process a bit by transferring to a new filter as soon as the liquid stops dripping through. Don't forget to put on gloves. You might be able to speed up the process even more by gently squeezing the filter as you transfer. Gentle is the keyword here. Here's what happens if you get a bit too heavy handed. 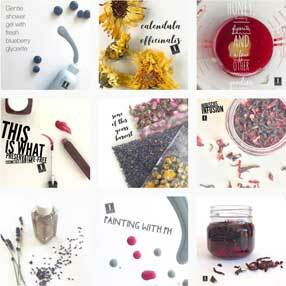 The filter bursts, seeds and bits escape, and you get to start over. 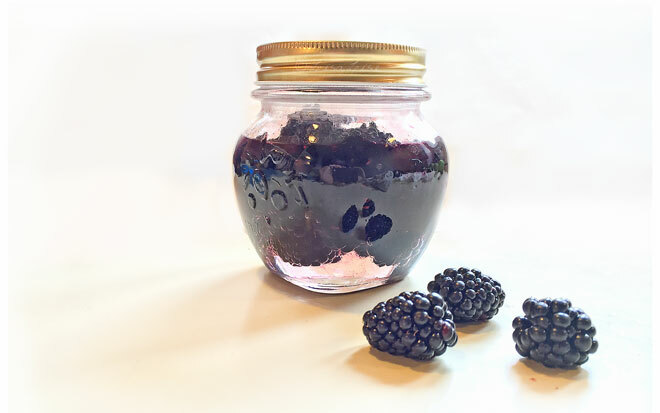 When the liquid has run through, transfer the glycerite to a bottle, add a label (remember to add a date), and enjoy your fabulous blackberry glycerite! You can use a glycerite in place of glycerine in any formula. 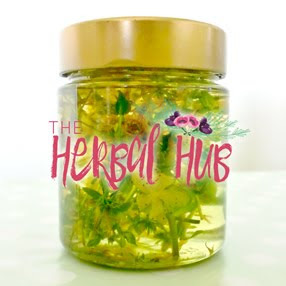 It adds the delicious scent of the food (or herbs) you have infused as well as the water-soluble actives of your ingredients. 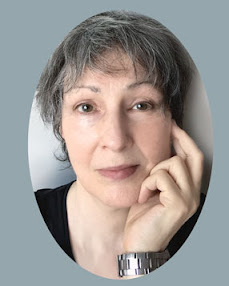 @María - thank you - yes, it is quite deliciously scented! 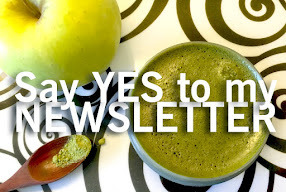 @Jemila - thank you- I hope you have great success with it! My question would be this,if I'm making a glycerite of grapes or carrot for instance, and using it as an active in a body lotion,do I still have to keep the dosage below 10%,considering that it carries my actives. HI Unknown - yes you can. Be sure it is clean, and if it is not very tightly woven, use a double layer.